An Easy and Relaxed Mortgage Loan Experience! Buying a home is one of the biggest financial decisions you will make in your life. However, attaining the loan you need to make it happen shouldn’t be a headache. When you work with an experienced loan officer, applying for a home loan can be a smooth and successful process, one you’ll remember fondly as you turn the key in your new residence. I’m so happy for you! There are multiple factors to review and consider on the path to your new residence, especially if this is your first time purchasing. I bring years of experience and passion for your success to the table, and am here to help every step of the way. 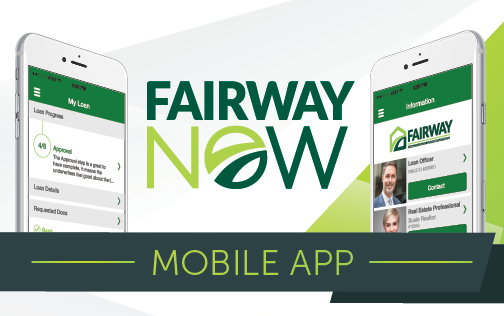 You probably want the process to be as simple as possible, which is why my team at Fairway offers quick, convenient online applications that take 15 minutes or less to complete. Once you submit an application, you’ll be able to check your loan status whenever it works best for you. You’re excited – the remodel of your dreams is finally within arm’s reach. Whether you’re looking to rework your kitchen, bathroom, or backyard, I’m here to help you find the perfect loan for you and your family. Helping you become a first-time homeowner and/or attain your property-related goals is my passion and top priority. For a mortgage loan process that’s as enjoyable as it is productive, give me a call! I’m here to provide guidance and steady support throughout the process, from your first inquiry to the first day in your new home. Closing Loans in As Little as 21 Days! Your future is waiting, so I’m here to help you close on your loan as soon as possible. My team at Fairway Independent Mortgage Corporation works to close on your loan within 21 days, efficiently managing time throughout the process with in-house underwriting, processing, and expedited decision-making. Have an urgent or unique transaction? I am here to make it happen!